Thanks for the E-mail. Please feel free to use the Hometown story about St. Raphaels on your web page. ST. RAPHAEL'S - Out of the ashes of St. Raphael's Church has risen a flourishing, community-minded group. The Friends of the Ruins was organized in 1995 following a public outcry that the historic site possibly faced demolition. 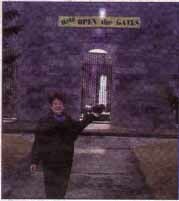 Dedicated and committed to opening the locked gates to the gutted interior of Upper Canada's first Roman Catholic parish, the group is well on their way to achieving their goal. "We've raised $200,000 since we began our project," said Colleen Kennedy, committee chairperson. "We've been fortunate to have some very generous donors from across Canada and the United States who have really helped our cause. Many people who no longer reside in the area are deeply-rooted to Glengarry, or have ancestors who are buried here." It is hard not to recall that fateful evening of August 10, 1970 when flames engulfed the church. Built in 1821, by a group of Scottish settlers, under the direction of Bishop Alexander Macdonell, what remains of St Raphael's Church has recently been declared a national historic site. This will certainly help the Friends of the Ruins in attaining their goal said Kennedy. "It's given us legitimacy in our cause," she said. "We're not just saying that we think it is an important structure, we have proof now. "One of the best things we ever did was having it declared a national, historic site." She is hopeful that the official designation will help the committee achieve their objective of raising the necessary $500,000 for reopening of the site. "We have made applications for Millennium and Trillium funding, as well as from the Historic Sites and Monuments boards," said Kennedy. "Fundraising has been done on a regular basis through initiatives like sporting tournaments, clothing sales, and sales of donated paintings done by local artists, Stuart McCormick and Ted Sonne. "The Brigadoons have been great friends to the Ruins, too, and have recorded a wonderful CD for us." Friends of the Ruins are already planning for the future. They realize that even if the half-million dollars are raised to make the structure sound, there will be ongoing maintenance costs. "We've put aside 10 per cent of all funds we've raised towards perpetual care for maintenance," said Kennedy. "When we started this project, we didn't know if we could do it. It was a lot of money for a small community to, raise. "But it looks as if things are finally coming together." Those interested in helping to preserve St. Raphael's Church can become a member of the Friends of the Ruins for a $25 donation. Donations can be sent to Friends Of The Ruins, St. Raphaels Inc., Box 190, Williamstown, Ontario KOC 2J0. 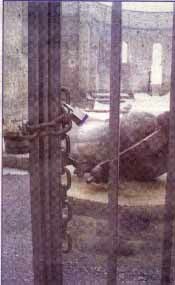 LOCKED UP - The bell from the former church sits behind locked iron gates. Caption for photo on right. HISTORIC VIEW - The cemetery at St. Raphael's is part of the National Historic Site. Caption for photo on left. COMMITTED VOLUNTEERS - Colleen Kennedy and the Friends of the Ruins vow to see the gates open once more. * St. Raphael's was the only Catholic-congregation in Glengarry from 1786 untill 1833? *St. Raphael's was the name of the saint whom the earliest settlers travelled under? *The first Bishop of Upper Canada, Bishop Alexander Macdonell, was the parish priest at St. Raphael's? *Bishop Macdonell was responsible for the spiritual welfare of Roman Catholics scattered throughout the whole of Upper Canada - a distance of 540 miles? *The stone plaque on the outside of the ruins that reads 'House of God' in Gaelic is spelled incorrectly? *St. Raphael's was the birthplace of the Honourable John Sandfield Macdonald who was the first premier of Ontario? *St. Raphael's is a fine example of Canadian neo-classic design? Pegs replaced nails and carefully stressed rafters made pillars unnecessary.